Hi! Welcome to Folk Art, a Seattle-based floral studio and flower farm devoted to bringing people joy through local, sustainable, and beautiful flowers. We’re delighted you are here! Folk Art Flowers offers a flower subscription service, individual arrangements, wedding and event flowers, and more. Our flowers are sourced locally through family farms in the Pacific Northwest that use sustainable growing practices. In the winter months, we occasionally source flowers from California. 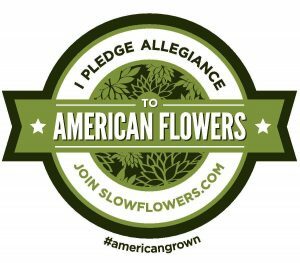 We believe in American-grown flowers and will never use flowers that are flown in from another country. If you have a flower subscription, we will collect your vase each week to avoid unnecessary waste. We also avoid floral foam, which is a petroleum-based substance that does not biodegrade. Please visit the shop to see our offerings, including bridal or event consultations. If you don’t see what you need there, feel free to get in touch so we can make amazing things happen! In 2019, there are big plans for the farm side of the business: the dream is to produce everything that gets arranged. We are currently looking at local land options for the 2019 season so that we can get some baby plants in the ground! Our commitment is always to sustainability, which means building soil health naturally, avoiding the use of pesticides through integrated pest management, using only organic fertilizers, providing habitat for wildlife and bees, and rotating crops. Please sign up for our newsletter or check the blog for farm updates! A snapshot of peak dahlia season in Oregon. I visit farms whenever I can, because I always learn something. My name is Carolyn, and I started Folk Art after a long journey in doing work that did not match my strengths. Early on I did Peace Corps, which was incredible mostly because I got to work with farmers all day. I kept climbing the ladder, including jobs that let me travel, but I was miserable behind a desk. What I did love about my work was working with other farmers in the field and connecting with people and nature, so I decided to start doing more of that. After moving to Seattle, I joined the Sustainable Farming Education Program at Tilth Alliance, which is a farming incubation program for beginner farmers. I joined a farm to see a full season in action, and started growing flowers in my backyard. I also did a lot of arranging and experimentation to improve my craft, and did full-service flowers for several weddings. (I also joined two bands, which is another story!) After this wonderful incubation period of creativity and learning, I finally decided to start Folk Art Flowers. I am so excited and grateful to be able to share some of my joy with you by bringing you beautiful, local, and sustainably produced flowers.